We'll start with a done deal in Europe, Javier Saviola (remember him??) has finally ended his Real Madrid bench-warming session and has moved to Benfica for 5m Euros. Back in Argentina: With just over a week to go before Huracán's title showdown with Vélez Sarsfield 20 year old playmaker and golden boy Javier Pastore may have so far escaped the attention of Maradona but has caught the eyes of Serie A side Palermo. Club president Maurizio Zamparini told El Grafico magazine 'Pastore is practically ours, all apart from the official seal, but we're waiting until the end of the Argentine championship'. All of which maybe news to Huracán, although this being Argentina the club may not have it all their own way in negotiations. In the murky world of 3rd party player ownership 45% of Pastore's contract is in the hands of private individuals whilst the remainder is with Huracán in addition Talleres de Cordoba are in line to receive 10% of any transfer fee. On this occasion the Palermo president's words may be just posturing. Over to Avellaneda where Racing have celebrated avoiding the relegation play-offs by off loading 18 year old midfield dynamo Franco Zucculini to Bundesliga upstarts Hoffenheim for $6.7m where he's signed a 5 year deal. Still at La Academia defender José Shaffer returns to Europe to join up with compatriot Saviola at Benfica. Independiente's fantastically named goalkeeper Fabian Assmann (!) is rumoured to be interesting both Chelsea and Aston Villa although with 25 goals conceded in 11 games (including three 5-0 thrashings) the attention seems to have waned. To the firesale at Boca Juniors where most of the current squad seem to be on the market following their failure to progress in the Copa Libertadores and current financial plight. General Manager Carlos Bianchi has recently taken a 50% pay cut to help balance the books. New coach Alfio Basile's first job will be to build a new side. Battling Colombian midfielder Fabián Vargas (29) has departed after almost 6 years and joined Spanish side Almeria on a 3 year deal. Onto some other potential movers, striker Rodrigo Palacio the owner of the worst rats-tail haircut in football may also be moving to La Liga, this time to Galicia with Deportivo La Coruna the deal by all accounts is done bar the signing. Fellow striker Lucas Viatri has been the subject of interest from Italian side Siena who are willing to pay upto $4.5m for him. Maybe only the mercurial Martin Palermo will be leading the line for Boca next season as Luciano Figueroa has ended his loan spell and will be returning to Genoa, although he's likely to be farmed out again but he's quashed any rumours of a return to River Plate. With River Plate also having failed dismally both domestically and internationally in the last year you may expect the vultures to be gathering to pick-up the talent gracing El Monumental. With club president Aguilar up for re-election later in the year his two most prized assets could well be staying on at least for the time being. Diego Buonanotte, the latest 'next Diego' and the cause of much speculation about his future over the last 12 months has once again attracted more than a passing glance from teams such as Lazio and Benfica, together with unnamed French and Russian sides. The player has admitted that one day Europe is his ultimate goal but as it stands only a big offer and/or a President not wanting re-election would see him leave in the close season; although if he does exit it would certainly ease the financial worries of the club and the propaganda machine would swing into action. Colombian striker Radamel Falcao Garcia (23) who has been one of the few shining lights; according to reports this week he is on the verge of staying with River for upto 3 years although the reality is likely to be an additional 12 months. Some others........Estudiantes have one foot in the Copa Libertadores final but that hasn't stopped goalkeeper Mariano Andújar joining Serie A's Catania on a 4 year contract. The newly capped international previously played for Sicilian rivals Palermo. San Lorenzo's striker Gonzalo Bergessio, another player owned by numerous investors may well join the boat to Europe with Porto showing interest. So there you have it, I'll try to revisit this in a month with updates and apologies for getting it totally incorrect. Bad pitches, Maradona’s psychological state, ex-Presidents showering gifts on players……after a crazy 10 days the football finally threatened to grab the headlines this weekend with crucial games at both ends of Primera A. Sadly violence has once again appeared at football with two fans paying the ultimate price. With Huracán closing in on their first title since 1973 and by general consensus playing the best football in the league their 3-0 home victory over Arsenal should be cause for celebration. However this being Argentina the presence of the Barra Brava is never too far away. At the end of the game fierce fighting took place involving differing factions of Huracán’s barras, the end result being two shot dead and four injured. To fans in Europe this in-fighting is a relatively alien concept where problems generally occur between different clubs. To control and lead a club’s gang in Argentina doesn’t just provide free entrance to matches, a great deal of money can be made engaging in other shady activities – to be a ‘capo’ is a fulltime job of what is in effect a criminal organisation. The battle of McDonald’s which took place earlier this year was for control of Boca Juniors infamous ‘La Doce’ also involved firearms and saw an innocent pensioner caught in the crossfire. The final game and title decider sees Huracán travel to Vélez where a draw would be enough to secure the Clasura. It's sad that for all the sparkling football played by El Globo under the stewardship of Angel Cappa off the field activity grabs the headlines in what could be an historic season. Coach Caruso Lombardi of Racing has an awful lot on his mind at present. With his team still not mathematically safe from a second relegation playoff in two years against a Primera B side many of his players have been struck down by the flu, reports speak of around twelve players in the sick-bay including Marcos Cáceres, Lucas Castromán and José Shaffer all of whom failed to train yesterday. Hope is high that many of these will recover sufficiently to make the trip upto the North West for Saturday's clash against already relegated Gimnasia Jujuy. It really wasn't supposed to be this way, Argentina's Promedio relegation system where average points per game are worked out using results from the preceding three seasons (both Apertura and Clasura) is supposed to protect the 'Big Five'. Surely none of these grand institutions could have 6 bad campaigns in a row? Perhaps the AFA didn't factor in the farce that has beset Racing Club over the last few years [see earlier posts]. A win against Gimnasia will be enough to steer them clear of the playoff this time round. As for the other teams in the mix San Martín de Tucumán are relegated bar divine intervention whilst any 2 from 4 could sink into the playoffs (Gimnasia de LA PLATA, Godoy Cruz, Rosario Central, Racing). I think this is correct but I don't have a degree in Statistics and the permutations are endless, so if this is blatantly wrong please feel free to put me right. Lombardi is also not very happy with the schedule of this Saturday's games, with la Academia's kicking off 6.20pm whilst relegation playoff rivals Rosario Central's game at Tigre kicks off at 9.10pm. His thinking behind this is logical enough, Central will know what they have to do against Tigre. As we all know logic and formula go out of the window and TV executives are responsible for dictating the times of many games. The final monkey on his back is ex-President and husband of current incumbent, Néstor Kirchner who being a Racing fan has been turning up at training in recent weeks for photo shoots with the players. He visited in the week preceding their victory against Boca Juniors (3-0), perhaps it was the promise of LCD TV's which inspired the team's win? Not wanting to miss a photo op Sr. Kirchner turned up earlier this week to deliver the aforementioned televisions.......but only four of them???? Surely he could have stretched to one each??? At the other end of the table things are getting almost as exciting as last December only with different teams. Huracán who are looking for their first title since 1973 take on Arsenal who were unlikely 4-1 winners last weekend against other title contenders Lanús. This Sunday top of the table Veléz are away at Lanús where a defeat for the home side will see the end to their championship hopes. Bad news for Argentina, and contrary to what some commentators have been spouting over the past 12 months – Lionel Messi is human. His first half miss against Ecuador proved that even superstars can have off days. The penalty miss from Carlos Tevez in the same half demonstrated that he’d been taking lessons from Manchester United teammate Dimitar Berbatov. At this level you have to take your chances – never was a cliché more apt as La Selección were beaten 2-0 in the monsoon like conditions of Quito. The classic game of two halves saw Argentina make a composed and solid start playing with a back four as opposed to the back three which started against Colombia. Ecuador threatened much more in the second half as Argentina were pushed further and further back with the thin air taking it’s toll, possession was ceded far too often. Two goals in 10 minutes reawakened memories of La Paz and a 3rd goal was only prevented by the post. This was by no means Bolivia Pt II, however the manner in which the team folded in the 2nd half is cause for concern. ‘Yesterday we lost the game and we should have won it, we lacked a goal. We played well’ Carlos Tevez in bullish mood, although this positivity was tempered by a more sobering ‘we have to be worried [about qualification] although it’s all in our own hands’. September sees them take on Brazil at home and Paraguay away. To make a bad night worse the team’s aircraft suffered technical problems and as a consequence the players were condemned to spend another night Quito to contemplate how it all went wrong. A win is a win. Argentina's victory over Colombia last night put qualification for South Africa back in their own hands but the doubts still remain. Diego's jig of delight at the end of the match must surely have been one of relief as opposed to unbridled joy as his team huffed and puffed towards 22 points. The winning goal when it finally did arrive came as a result of Colombia's inability to defend a corner although the volleyed finish from defender Cata Diaz was extremely well taken. By all accounts Diego gave his charges a damn good telling off at half time and with the addition of Zanetti they started the second half much stronger. Alarm must surely be raised at the lack of chances created from open play during the game given the talent on the park. Colombia were definitely up for it and certainly put themselves about - Aguero was clattered by Vargas of Boca Juniors, and limped off replaced by Milito. Given the time difference I was a little bleary eyed but I don't remember Milito having a shot on goal. Messi also seemed to be uncharacteristically rattled by the approach of Colombia although any protection from the Bolivian referee was non-existent. River's Falcao was a studs touch away from scoring on his club ground on one of their rare attacks. Hopefully in the interests of AFA harmony Maradona was on the phone to Batista after the game giving him a detailed report. For now the ghosts of La Paz have been exorcised next stop is Ecuador at altitude. On retirement many of us will be lucky to receive a pension. Things on Planet Football are somewhat different, sixty thousand Chilean fans packed into Santiago's National Stadium on Tuesday night to show their appreciation and pay thanks to a special talent: Marcelo Salas. Chile's record goalscorer bowed out in a testimonial between members of Chile's 1998 World Cup squad and the 'Friends of Marcelo' comprising some of the player's ex-club teammates including Enzo Francescoli, David Trezeguet and Ariel Ortega. As is customary on such occasions the game ended in a diplomatic 3-3 with El Matador scoring a hat-trick. 'This is a very special moment. I only want to thank everyone who came to this match. I will never forget this night. I quit happy. I am done' - Marcelo Salas. One of Chile's greatest exports (along with Iván Zamorano and the bottle of Carmenére I enjoyed over the weekend) Salas moved from Universidad de Chile to River Plate in 1996 and effortlessly continued his goalscoring form making him an idol of the fans. River dominated the domestic game in 1996/97 and won 3 championships during this time with Salas contributing almost a goal every other game. Salas couldn't be described as a pin-up, looks wise he's the antithesis of today's waxed and moisturised pros. His talents as a striker however are deadly and no better demonstrated than in the first of his two goals against England at Wembley, fantastic close control and a bullet of a left foot: http://www.youtube.com/watch?v=k14Ym55UXKY&feature=related. After a successful spell in Italy winning the league with Lazio a serious knee injury meant that his most prolific period would forever be consigned to memory. He played a lowly 18 games for Juventus. His second phase at River was greeted ecstatically by the fans and in spite of injury he still managed to win the Clasura in 2004. His playing days ended back at his old stomping ground of Universidad de Chile. 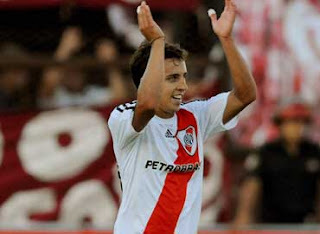 What would River and their legions give now for an even half fit Salas to lead the attack? Argentina is renowned as an exporter of fine football talent, occasionally an import makes a splash - El Matador we salute you.